Code Tune is a GUI-based performance analysis tool, also called a profiler. Capable of analyzing running processes and spawning new processes with a given environment. Supports 32-bit and 64-bit targets. On 64-bit, WoW64-processes can be profiled with the 32- and 64-bit versions. Control the start and stop of the sampling processes through the Code Tune C API. Source code for building a light-weight Python wrapper for the Code Tune API, pre-built .pyd’s for Python 2.5, 2.6, 2.7, 3.0, 3.1 and 3.2 part of the distribution. 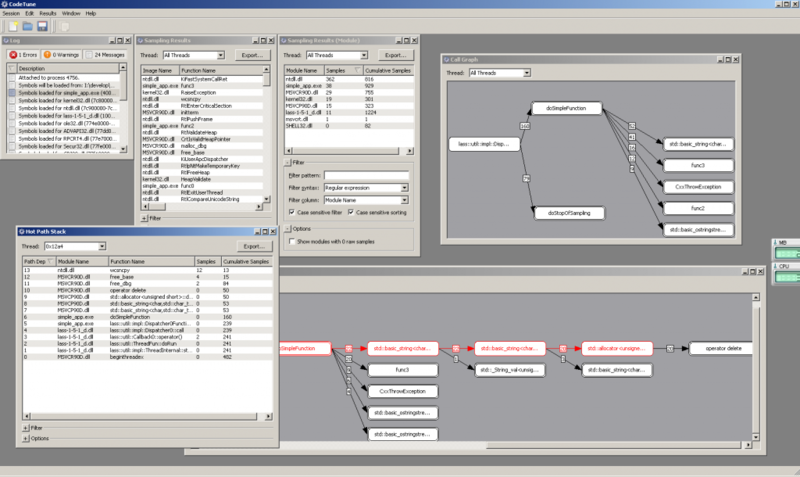 Call stack sampling: tracks caller-callee relationships and shows them using a call graph. Identification of the hot path: the path through the call stack graph where the dominant part of the time is spent. Multi-threading aware: combine data for all threads or view data for a single thread. Export all collected data into text based formats for analysis in other tools. Easily show the source code of the profiled code. Browse through samples, measure time spent in cycles on the CPU.